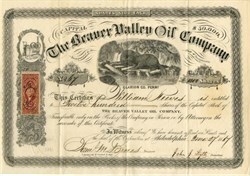 Beautifully engraved certificate from the Beaver Valley Oil Company issued in 1867. 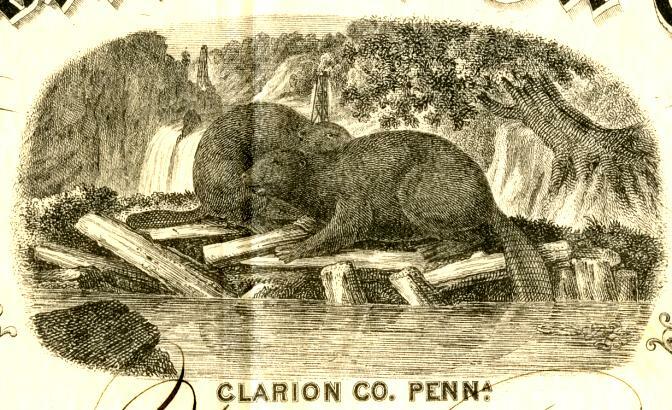 This historic document has an ornate border around it with a vignette of beavers working on a dam. There is a red 25 cent Civil War Era revenue stamp attached to the front. This item has the signatures of the Company's President and Secretary. Clarion County is a county located in the U.S. state of Pennsylvania. It was formed on March 11, 1839, from parts of Venango and Armstrong counties.